I admit, I've never been much of an A.E. van Vogt fan. I've never read SLAN, although I've owned copies of it. I don't know if I do now or not. Should I read it? Other stories in this issue of ASTOUNDING are by Theodore Sturgeon, L. Sprague de Camp, Malcolm Jameson, Harry Bates, and Nat Schachner. That's a pretty strong line-up. The cover is by Hubert Rogers. A.E. van Vogt was one of the masters. SLAN and the NULL-A series remain my favorites from the early age of SF. Well worth reading. Darn near 40 years since I read Slan but I remember liking it quite a lot. This issue also has Farewell To The Master by Harry Bates that the film The Day the Earth Stood Still was based on. A classic yarn and well worth reading. I read SLAN a long time ago and liked it but my feeling now is that it may be dated. I have the opening illustration original art by Charles Schneeman hanging in my bathroom. I often look at it while I'm shaving. 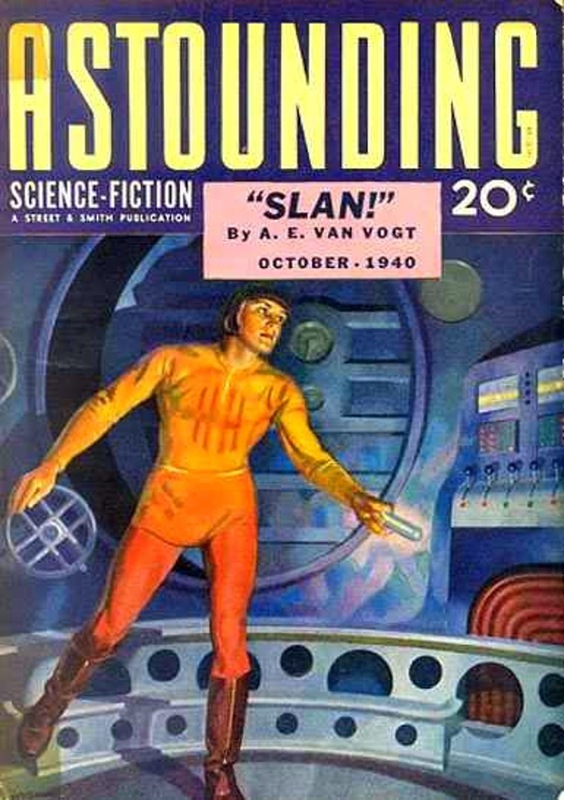 Do people still read van Vogt? I recall reading some of his stuff when I was a teenager in the late 50s/early 60s and found them confusing, although they had a propulsive quality I liked. Twenty years later I tried them again and found that the propulsive quality didn't make up for the awful writing and the totally nonsensical plotting. Tried rereading Slan a couple of years ago and didn't get very far. The writing is just horrible. My 12 year old self who read it in the early sixties was less discerning. I read it years ago and was underwhelmed. But it is the inspiration for Slan-Apa, which I've been a member of for over 30 years. Wouldn't it be wonderful if a publisher would revive the pulps! Your postings make me nostalgic. I remember browsing the newsstands in the mid-to-late 50s. Forbidden treasures were lurking there for a lad! James, I too have never read SLAN (nor DUNE, nor any Heinlein...my classic sci-fi reading is woefully deficient). With a TBR pile already too large, I doubt I'll remedy that in this lifetime. Plus, based on the comments above, sometimes I think that type of material is best encountered when one is young. I checked my shelves and don't seem to have a copy of SLAN. Maybe I'll pick one up sometime. Or not. The only van Vogt book I have is EMPIRE OF THE ATOM. Haven't read it, but maybe I will. Or not. DUNE I read when it was new, but I've never reread it and haven't read any of the sequels. Heinlein, though, I've read a bunch of, and I've been thinking about rereading some old favorites and reading the ones I never got around to. SLAN is okay but WORLD OF NULL-A is better. Best of all is the novel-length THE WEAPON SHOPS OF ISHER, an expansion of "The Weapon Shop". I may be a little off on the titles; working from memory ain't what it was.